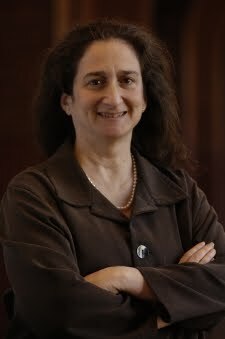 Barbara Feinman Todd, Journalism Director for Georgetown University's English Department, is a co-director of the Pearl Project. She has worked in Washington as a freelance editor and writer for more than two decades, assisting as ghostwriter, editor or researcher for senators, journalists, and business leaders on several high-profile books including Bob Woodward's VEIL; Carl Bernstein's Loyalties; former Congresswoman Marjorie Margolies-Mezvinsky's A Woman's Place: The Freshmen Women Who Changed the Face of Congress; former Washington Post Executive Editor Benjamin Bradlee's A Good Life; Palestinian spokesperson Hanan Ashrawi's This Side of Peace; former First Lady Hillary Clinton's It Takes A Village; and former Nebraska senator Bob Kerrey's When I Was A Young Man. 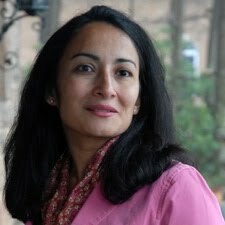 Asra Q. Nomani, a former reporter for the Wall Street Journal, teaches journalism at Georgetown and is a co-director of the Pearl Project. She is the author of Tantrika and Standing Alone. She has written for the New York Times, The Washington Post, TIME and other publications and received a 2007 opinion writing award from the American Academy of Religion. The American Association of University Women named her a 2007 Woman of Distinction. She has commented on Islam, motherhood and journalism in venues from CNN, BBC, Al Jazeera to NPR. 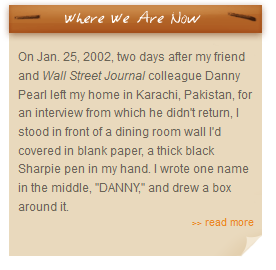 She delivered an NPR commentary that the same spirit of investigative journalism that imbued Pearl's work lives in the students of the Pearl Project.